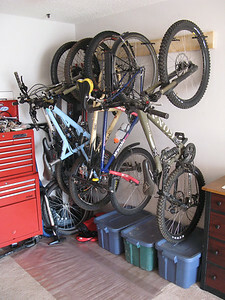 July 4, 2010, 12:27 p.m.
Is it best to put the hooks in the wall studs or hang the bikes from hooks in ceiling joists? I presuming the later puts less stress on the spokes? Any pros/cons on hanging from front or rear wheel? Any suggestions for the best spacing for the hooks? Studs and joists are on 16 inch centers. Would that be too close? Presumably I could alternate the bikes, but it's easier to lift them up and hang them by the from wheel. July 4, 2010, 1:18 p.m.
fox recommends you store your bikes standing up (on their rear wheel) so that fork oil coats the seals and keeps them moist and supple. July 4, 2010, 1:19 p.m. I hang mine from the ceiling by the rear wheel. I have six of them hanging with no issues at all. I used a 2x6 to span joists and screwed the rubberized hooks into that and angled the hooks at a 45 deg so the bikes all hang close to the wall. July 4, 2010, 1:48 p.m. Hanging bikes off your ceiling by the front wheel is a great way to do it. A way to get around handlebar clearance is by loosening and rotating your stem sideways, its much easier than trying to hang and unhang bikes that are alternating right-side-up [HTML_REMOVED] upside-down. Only time that method doesn't work as wellis with Directmount Stems…which it doesnt appear you have. July 4, 2010, 4:07 p.m.
July 4, 2010, 4:45 p.m. The toggle bolts mean you don't have to worry about being centered on a stud. Stagger the bikes vertically so your bars can overlap. The Leonardo hooks aren't perfect for mountain bikes - there's not enough clearance between the wall and the hook to get a big tire through there. MEC used to sell some different hooks that worked better, but I don't see them online now. Rock Shox recommends pumping the front shock about 10 times before your ride if the bike has been stored vertically. Sometimes if you don't, the shock can do a really rapid compression on an otherwise small hit, sending you OTB. July 4, 2010, 5:45 p.m.
We have 4 bikes in the bike errr… Dining room hanging by the front wheel from hooks, dangling from ceiling. If needed, we have wall hooks for up to two more. Definately recommend the ceiling vs. wall. July 4, 2010, 7:05 p.m. Thanks folks, ceiling it is. Any adverse effects with long time storage hanging from front or rear wheel? July 4, 2010, 7:33 p.m.
Watch you don't knock / pinch the valve stem when you are hooking..
And don't hit your head on the handlebars leaning down to pick something up. July 4, 2010, 8:04 p.m.
this is mine, can't hang them from the ceiling because it's in a closet space. the hooks aren't great, i need to get some custom made - the hooks from the hardware store need to have one more bend in them. there's a piece of plywood screwed into the studs, and then the hooks are screwed into the plywood. July 5, 2010, 1:56 a.m.
Only complaints I've ever heard of (or seen) have to do with components that have fluid, such as forks or hydraulic brakes. July 5, 2010, 8:55 a.m.
July 5, 2010, 10:34 a.m.
Use good long beefy screws to lag a 2x6 to the studs, then put the hooks into the 2x6. Remember that the lower tire that touches the wall will leave black marks. So either live to love the black marks or put some cardboard in there. July 5, 2010, 11:03 a.m.
July 5, 2010, 12:22 p.m. Here is our setup. 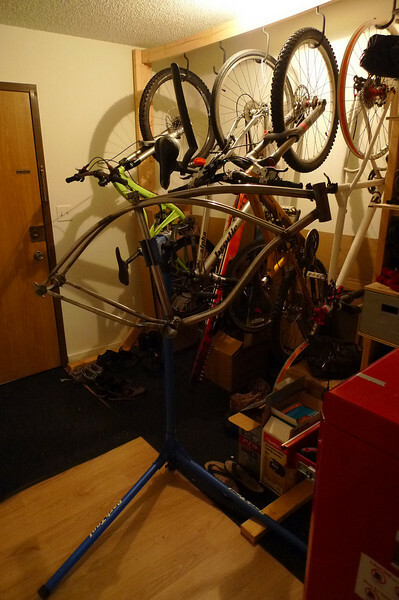 We even have a floor-ceiling rack from MEC which doubles as bike repair stand and pannier holder.